Nomad Foods is a leading frozen foods company building a global portfolio of best-in-class food companies and brands within the frozen category and across the broader food sector. Nomad produces, markets and distributes brands in 15 countries and has the leading market share in Western Europe. The Company’s portfolio of leading frozen food brands includes Birdseye, Iglo, and Findus. We’re pioneers of frozen food. 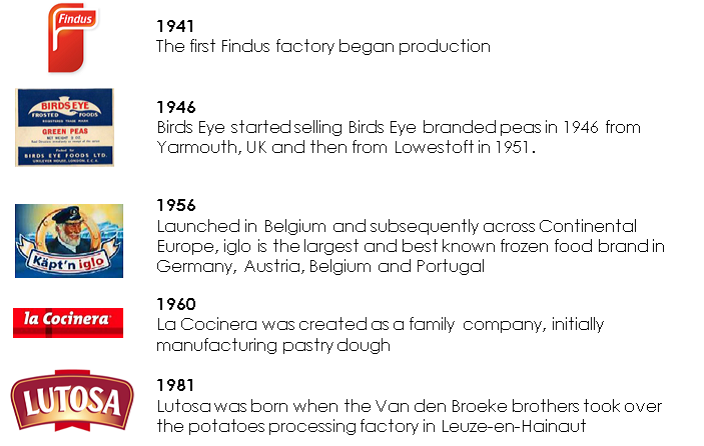 We were founded by General Foods, which in 1929 bought the rights to use a fast-freezing process, patented by Clarence Birdseye. Nomad Foods completed the acquisition of the Southern European and Nordics businesses of the Findus Group. This coming together of key brands has created a leading packaged foods company that is seeking to further expand through building a global portfolio of best-in-class food companies and brands within the frozen category and across the broader food sector.